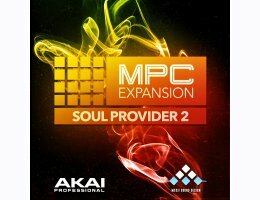 Akai Professional & MSXII Sound Design are proud to bring you the follow up to the acclaimed MPC Expansion Soul Provider (Vol 2). Soul Provider 2 is blend of a golden hiphop vibe with a modern twist. The sound pallet and live instrumentation was processed with various vintage samplers & outboard gear, resampled, and then flipped and formatted to create the classically authentic sound you’ve come to love from MSXII Sound Design. The textures once again feel as if they were lifted from vinyl with just the right amount of "dust" & character you’ll be looking for! The drums are punchy and dirty! Mello chords, vocals, and various chops are all fused together with the most soulful processing you’ll find in the MPC line up! All custom tailored to sit perfectly within the mix and much more. This sound pack will get your ideas going immediately! Soul Provider Vol. 2 comes directly ready to load into Standalone or Software Modes of your MPC. MSXII has taken advantage of the new plugin suite shipping with MPC 2.4+, so you’ll enjoy literally tons of brand new presets that showcase the sound design aspect of the expansion. Properly filtered bass lines, snappy EQ’s on snares, and punchy & vintage sounding kick drums come all courtesy of the brand new AIR plugins now shipping with the stock MPC line up! Use these presets as a learning guide & create your own, new textures if you’d like! MSXII Sound Design and Akai Pro once again deliver on the grooves & sounds that have stood the test of time and defined an entire genre of music. Soul Provider Vol. 2 delivers once again for the MPC user that needs inspiration now! Each kit provides you with an excellent selection of samples and patterns that have been expertly programmed to inspire you no matter what music making mood you’re in.